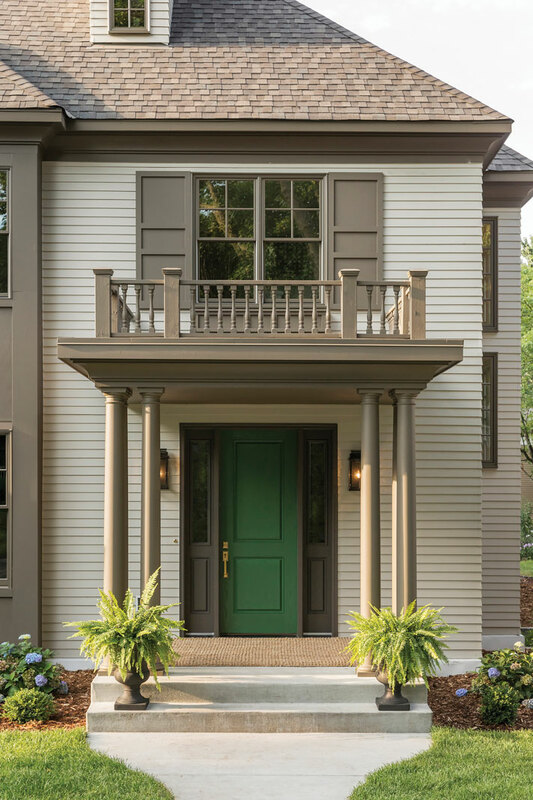 With its lap siding painted taupe and trim olive-brown, this Colonial revival whispers rather than shouts its presence on the 800 block of St. Paul’s Fairmount Avenue. Its builder, Detail Homes, didn’t want the house to be a jarring addition to the neighborhood of 100-year-old Victorians and Four Squares. 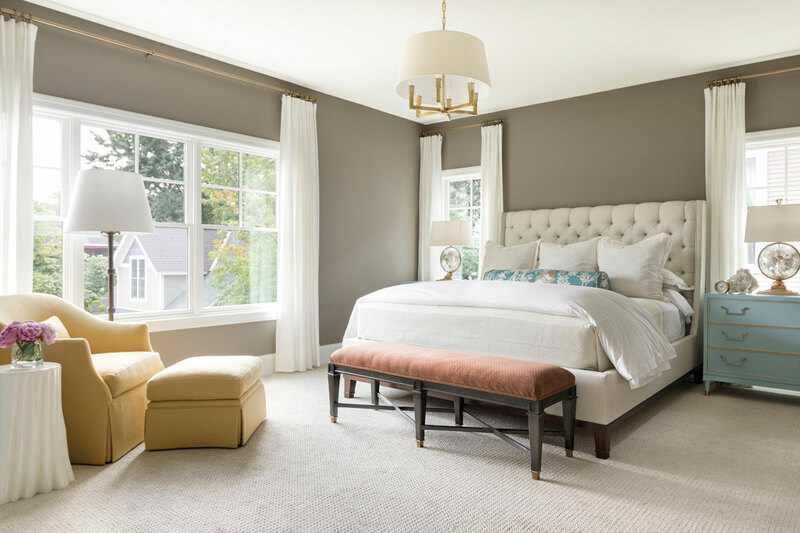 To help ensure its Crocus Hill neighbors would welcome (rather than resent) the new five-bedroom two-story, Detail enlisted help from Krista Gibbons, senior designer at Kipling House Interiors. “Our goal was to keep the traditional features of the street in mind but pare things back to create an interpretation of the rest of the street,” she says. All agreed the “bones” of the house should feel historic. Thus the home is tall and narrow, with double-hung windows and a front portico topped by a balustrade. And all agreed the house should fit lifestyles today. 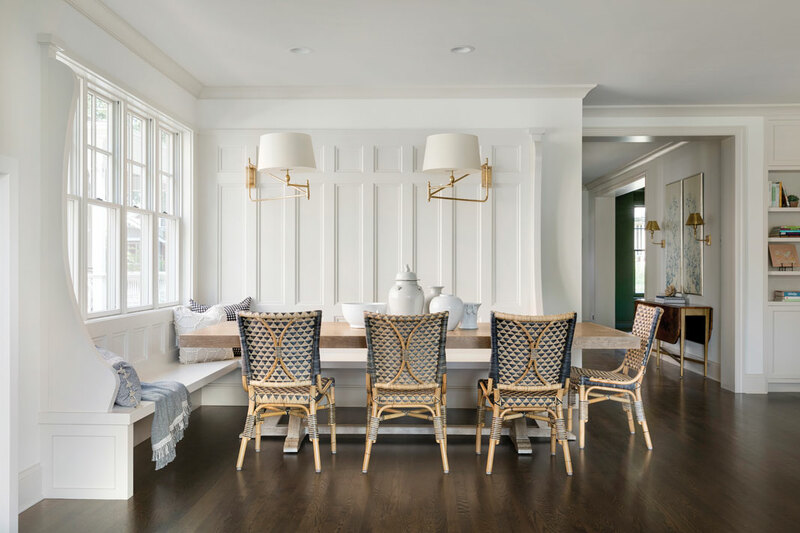 To help focus her thinking, Gibbons imagined a family of five—New Yorkers from the Upper East Side, who would appreciate historic details but also edgier design choices. 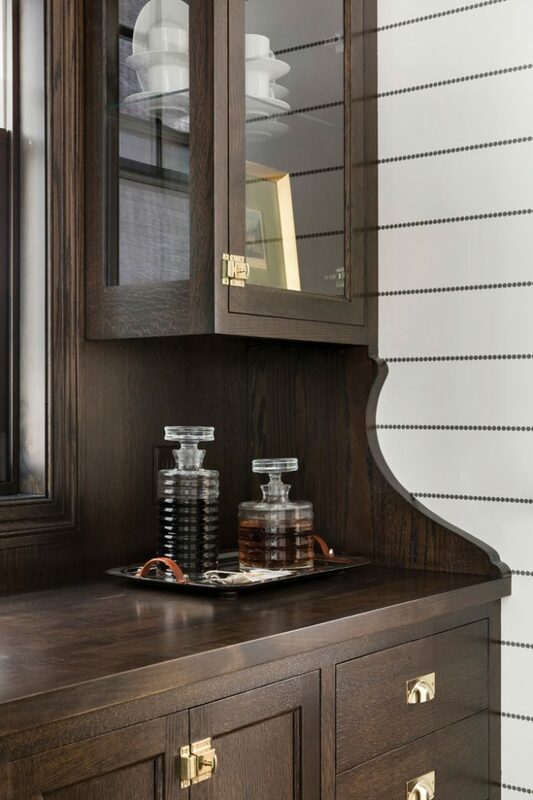 The attention paid to historic detail is on full display just inside the front door, where there’s a built-in paneled bench. To the left is a formal dining room and butler’s pantry. 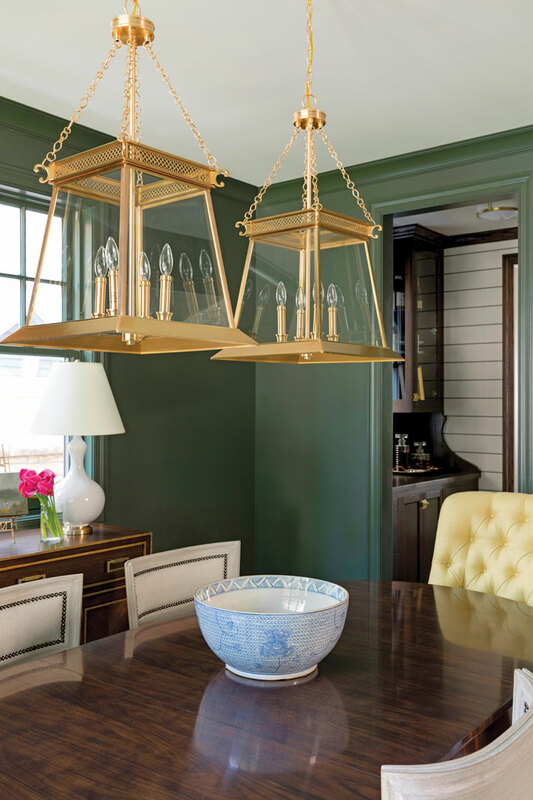 The 9-foot-high walls are topped with cove molding and anchored with 8-inch-high baseboard. The dark wood floors are narrow oak strips with parquet inlays. Three-panel interior doors are a lofty eight feet tall. 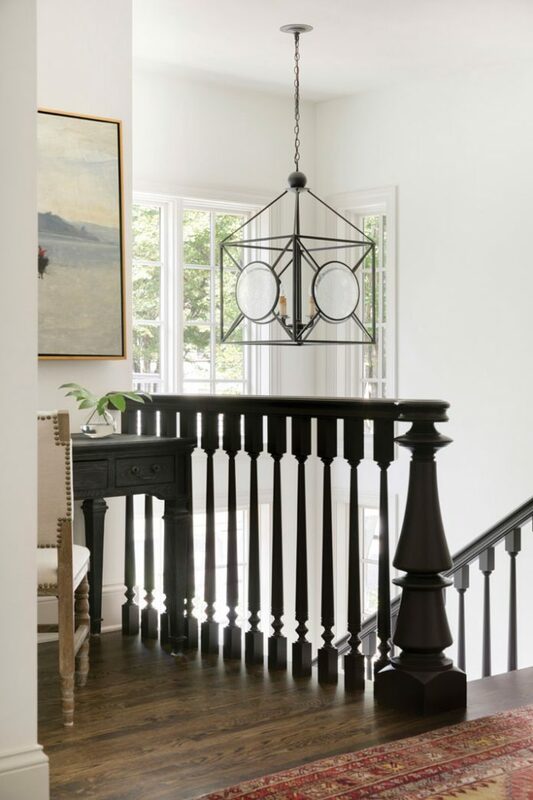 A bank of windows nearly two stories high floods the open staircase with light. 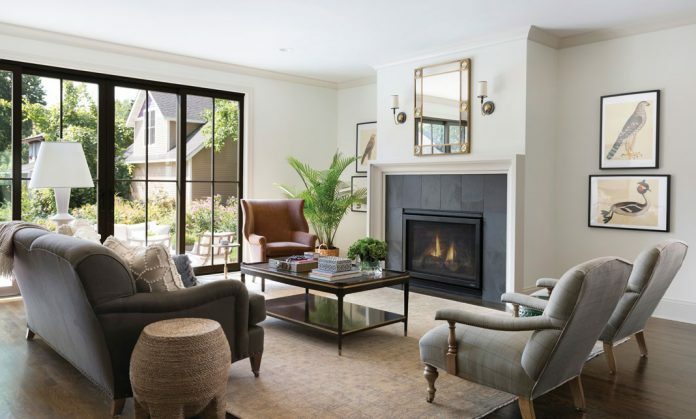 The home pushes the edge design-wise with touches such as an overly large baluster, elongated swing-arm lamps over a banquette, and a sleek black stone fireplace in the great room. And Gibbons’ color choices and application of them lend sophistication. 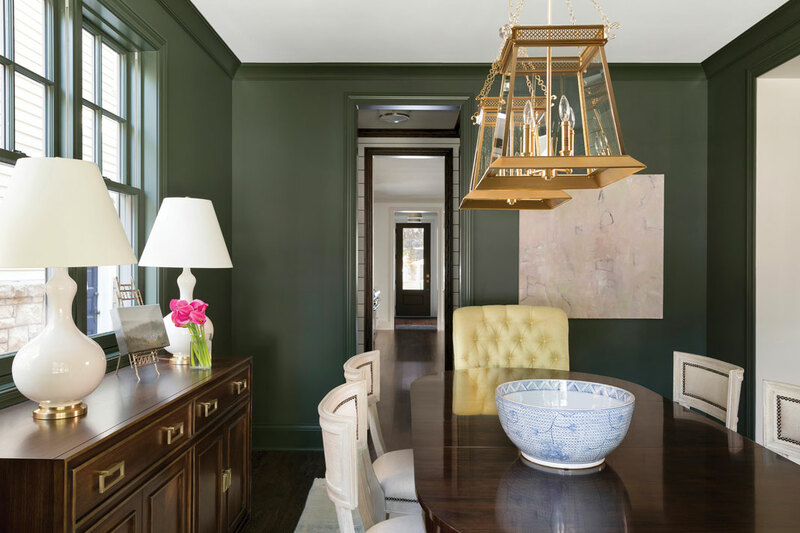 In the dining room, both walls and trim are painted an almost-black hunter green. 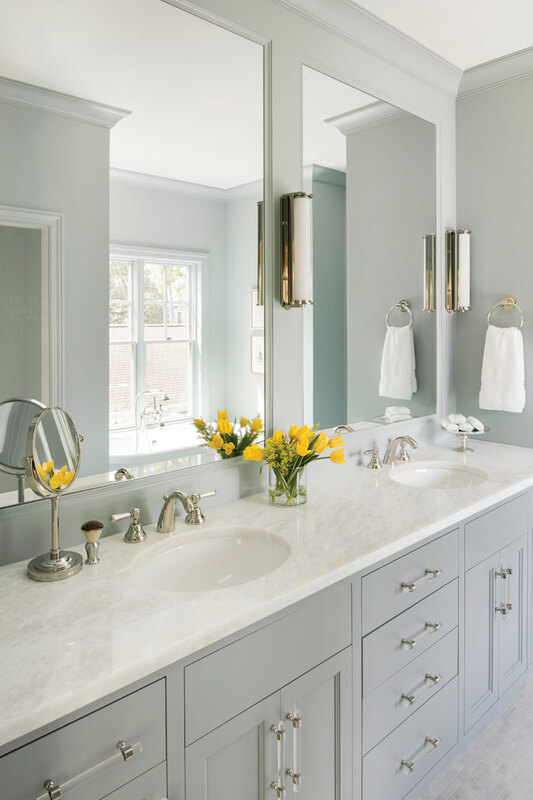 The master bath is awash in a hazy blue. 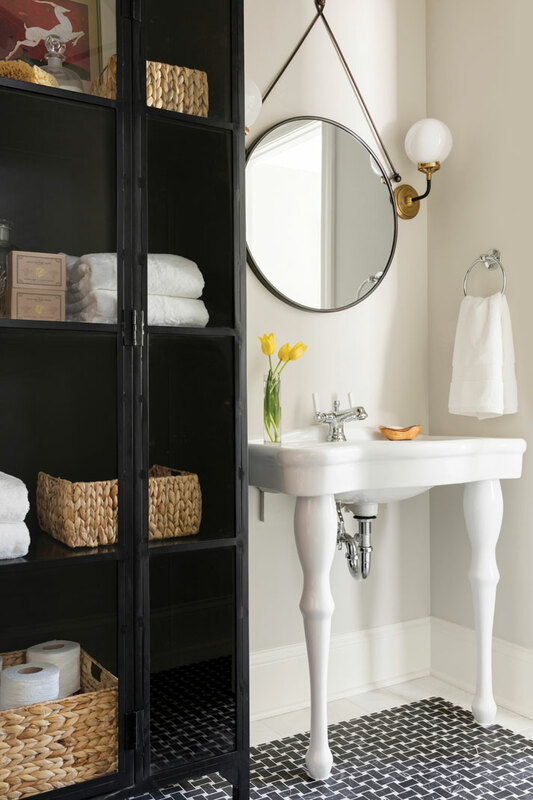 Cabinetry and built-ins are a putty color, rather than white. That the home was designed with a family in mind is obvious. There’s a main-floor mudroom with built-in cubbies. 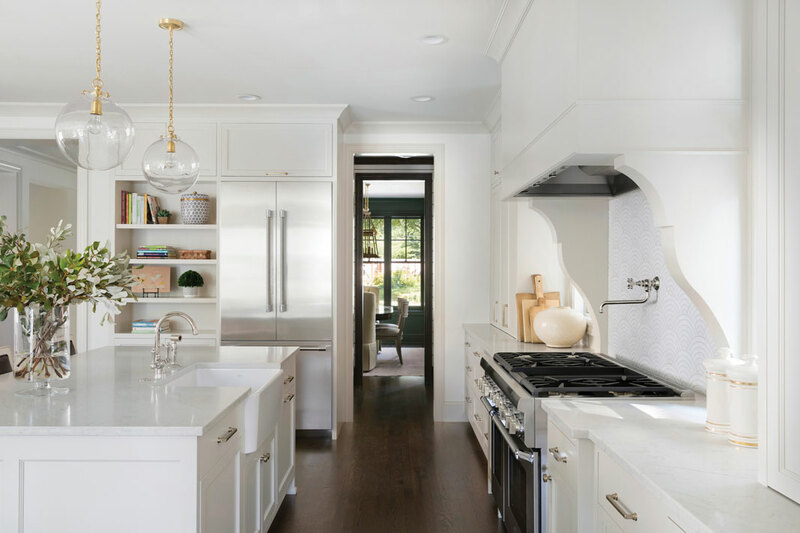 The open kitchen is both beautiful and practical. 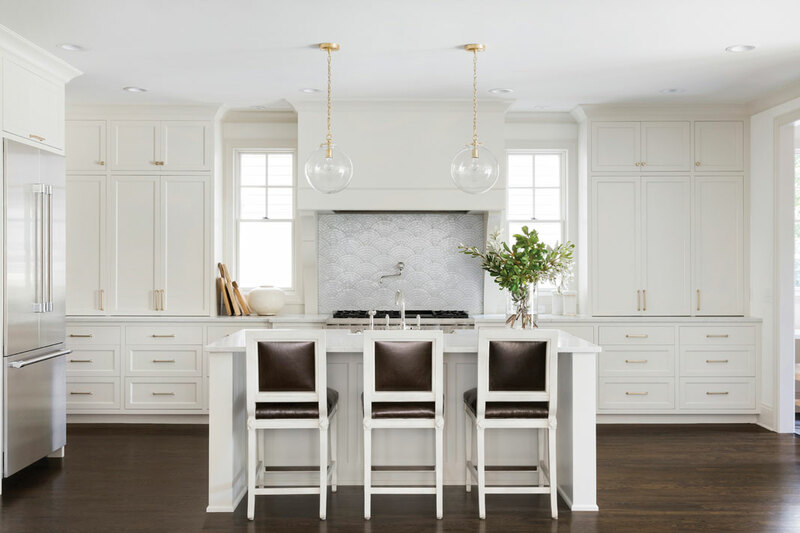 Countertops are an easy-to-maintain composite that looks like marble. There’s a farmhouse sink. Cabinets extend floor to ceiling, allowing for plentiful storage. The second floor boasts a laundry room as well as four bedrooms. 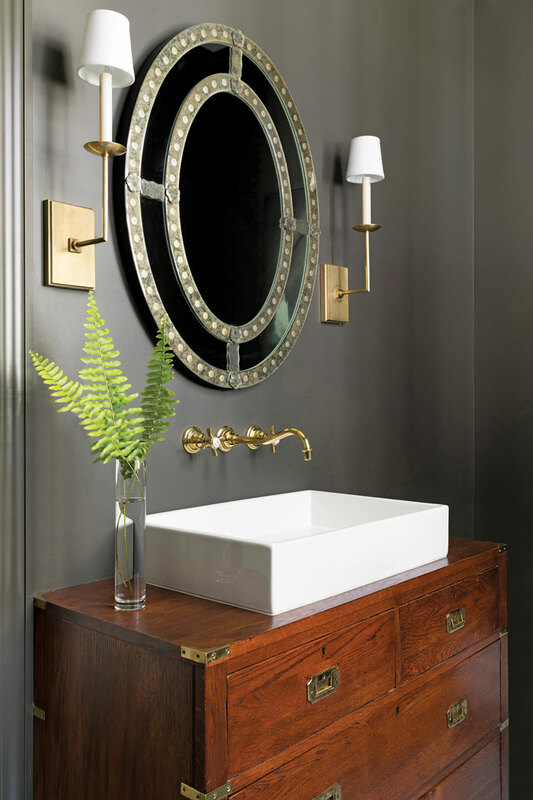 A “Jack and Jack” bathroom connects the boys’. The girl’s and the master baths are ensuite, the master with a pedestal tub and walk-in shower. 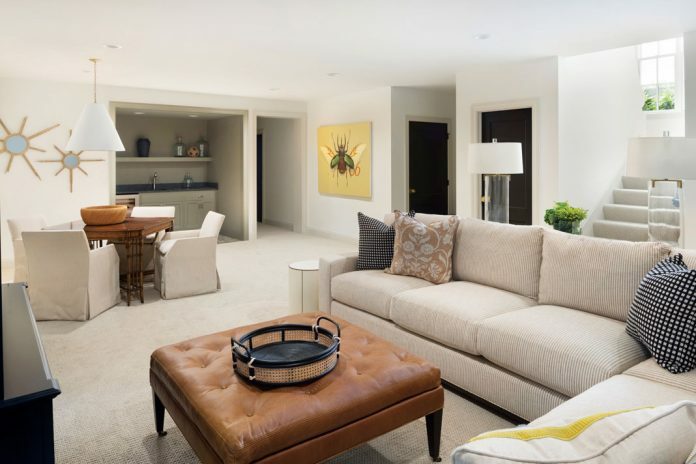 The lower level features a family room with a wet bar, an exercise room, and guest room. 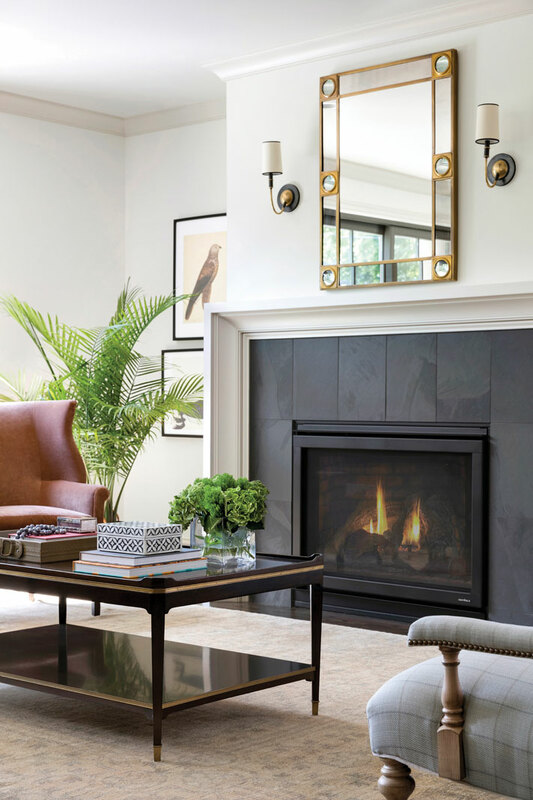 It all adds up to a home that is, as Gibbons puts it, “handsome, classic, and somewhat edgy.” And while it straddles old and new, beautiful and practical, it does one thing more. Hidden in three stacked closets is the structure to support an elevator, so its owners can age in place. This is a home that nods to the past, embraces the present, and has its eye set on the future. 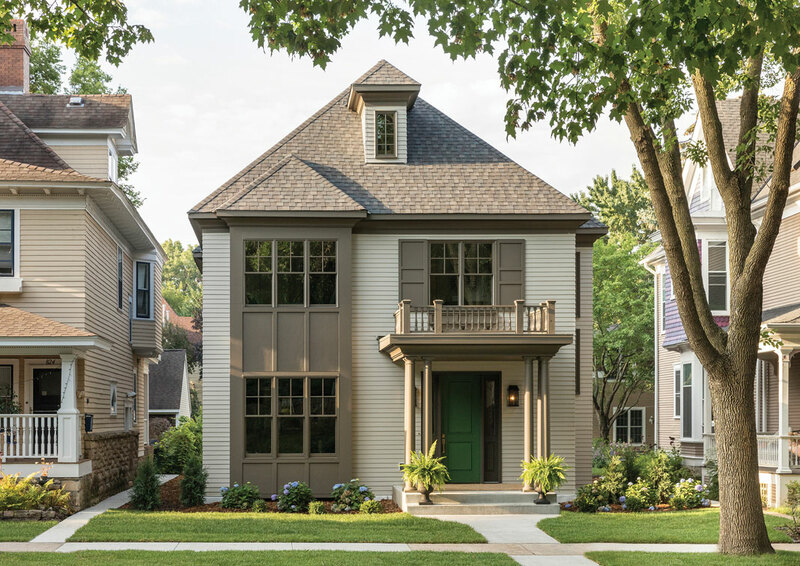 Carmen Peota is a Minneapolis freelance writer who, with her husband, has renovated three old houses and is contemplating the redo of their 75-year-old cabin. She writes about health and public policy as well as architecture and design. She recently lived and taught in Colombia, South America.